The New Hampshire Department of Transportation (NHDOT) I-93 Widening Project has won an America’s Transportation Award in the category for the Best Use of Innovation. This award was presented by the American Association of State Highway and Transportation Officials, the U.S. Chamber of Commerce, and the American Automobile Association (AAA). It is the direct result of NHDOT, the New Hampshire Department of Environmental Services (NHDES), the communities, the prime contractors, and the consultants – including Nobis Engineering – working together to make the I-93 widening project a reality. The innovation recognized – and that which led to this award for NHDOT and the entire project team – was protecting water quality with improved stormwater management methods. 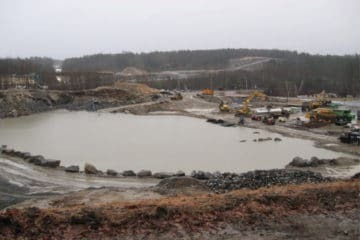 Construction along the I-93 corridor, and particularly at exit 3, created a public outcry early in the project as a result of sediment getting into a nearby lake and creating turbid conditions. Conventional erosion and sediment control Best Management Practices (BMPs) and typical management approaches to construction had proven inadequate to meet stringent NH water quality standards and the public’s demand for environmentally friendly construction. The stormwater treatment emphasis changed from conventional perimeter controls and filtration BMPs to a comprehensive stormwater management plan that included calculating runoff volumes and storage capacities, creating clean water diversions around active construction areas and the use of soil binders, cofferdams, pumps, and flocculant treatment systems to contain and treat virtually all stormwater runoff prior to release. The implementation of state of the art stormwater technologies has proven to be more valuable than just maintaining regulatory compliance; clean construction techniques have increased public support for the project, which helped NHDOT achieve its primary objective to create an opportunity corridor benefiting the local and regional economies of NH. Nobis’ John St. John, CWS, CPESC, worked closely with NHDOT and NHDES to recommend and design the components of the stormwater management plan. John has been at the forefront of the I-93 construction activities and the implementation of the stormwater technologies and has provided oversight of the operation and maintenance of the stormwater management systems. Great work, John, and congratulations to you and the entire NHDOT team for your win of the Best Use of Innovation Award and the many accomplishments achieved to deliver a successful project!